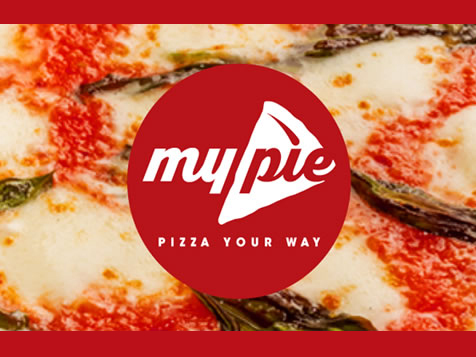 How do I buy a My Pie: Pizza Your Way Franchise? My Pie Pizza is one of the most promising pizza restaurant franchises to come around in a long time. Our focus on convenience, speed and quality has customers lining up for their own personal pizza. One of our main selling points? We allow customers to completely customize their own pizza pie, from the toppings down to the dough, using only the freshest ingredients, which are often seasonal. As you can imagine, this concept is taking off, which makes My Pie Pizza an incredible franchising opportunity. 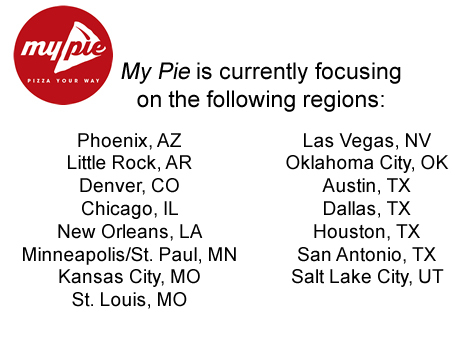 Open My Pie: Pizza Your Way in any of these available states: AK, AL, AR, AZ, CA, CO, CT, DC, DE, FL, GA, IA, ID, IL, IN, KS, KY, LA, MA, MD, ME, MI, MN, MO, MS, MT, NC, ND, NE, NH, NJ, NM, NV, NY, OH, OK, OR, PA, RI, SC, SD, TN, TX, UT, VA, VT, WA, WI, WV, WY. In A New York Minute! In spring of 2012, three guys from the East Coast were discussing how to grow their Italian Pizza Restaurant Crust. A few days later, one of the partners was in Chipotle choosing between chicken and beef when he envisioned sausage and pepperoni, and My Pie: Pizza Your Way was born. My Pie is a modern classic in the making, where each guest can custom-build their pizza using ingredients from authentic Italian recipes and have it served in a New York Minute! Americans eat on average 100 acres of pizza daily or 350 slices per second. 93 percent of Americans eat at least one pizza per month, easily making pizza the number one dinner choice in the United States. The fast casual pizza segment is becoming the new darling of the restaurant industry with more than 65,000 units and $40 billion in annual U.S. sales. Fast casual custom pizza shops are courting customers who are looking for fresh artisan-style pizza made in under 5 minutes, complementing their customizable pizzas with craft beers. NY Style – My Pie is distinguished by high-quality ingredients and traditional recipes passed down from generations of Italian New Yorkers. With homemade recipes and strong family values, you can taste the passion put into each pie. NY Fast –New York is about CONVENIENCE and SPEED! My Pie provides guests the ability to custom build their own pizza and watch it cook in just two minutes in the proprietary Neapolitan style 800* “Wave Oven”. NY Heritage –Real New Yorkers know the word loyalty. Family values are instilled in childhood and passed on through generations. The same loyalty and values are rooted in the My Pie culture, where the team of employees is like a family, proud to serve a great product and enjoying doing it! Custom selection of crusts, sauces, and toppings. Pizza ingredients based on traditional Italian recipes.2 minute bake time for pizzas. Unique seasonal specialties rotated throughout the year. Additional menu items include salads, appetizers, and deserts. Happy hour all day with half price refills of beer and wine. Organic New York style sauce, endorsed by football great Kurt Warner and available in jars for take-home use. Experienced, successful restaurant team as franchisors. Small-box footprint equates to lower investment dollars and reduced occupancy costs. Operating model empowers management efficiency and unit growth. Open space with family-friendly atmosphere. Attractive markets are available throughout the US. My Pie not only offers a taste of New York to local neighborhoods, but also remains focused on giving back to the local community. The partnership with Kurt Warner helps support his charity, The Treasure House, by donating 10% of all retail proceeds of the My Pie “Kurt Warner Marinara Sauce”. My Pie wants all of their guests to feel the passion they have for their food and their concept. The My Pie guys and every employee in every restaurant are committed to giving guests the experience of NY energy and great pizza! 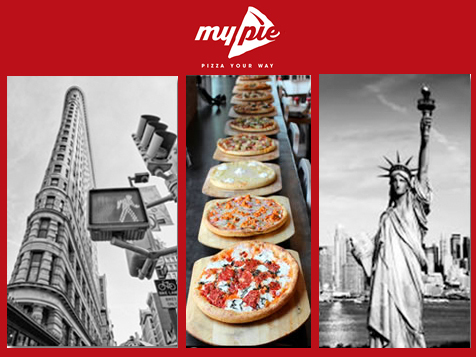 They want people to feel at home as a welcome guest invited to enjoy pizza with the My Pie family. My Pie: Pizza Your Way is not currently active in our directory, but here are some other recommended selections for you to explore.